Become a Fleet Feet Sports Pacer! We are currently recruiting pacers for our fall half and full marathon training program. We are looking for pace leaders for the Sunday long runs throughout the length of the 12 Week Program: August 23-November 9. Pacers are assigned to run a designated pace +/-:05 min/mile for the duration of the long runs on Sunday mornings at 8AM. 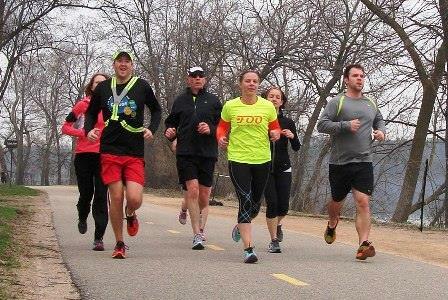 If you have experience running various half marathons and/or marathons enjoy motivating other runners, and are able to run with enthusiasm, dedication and commitment please contact Megan at dolanm@fleetfeetmadison.com for an application. Program pacers receive free program entry (not including race entry), product compensation, pace team perks, and the priceless feeling of helping your fellow runners achieve their goals! Pacers are required to attend a mandatory training session TBD before the training program begins. Fleet Feet Sports Madison is also providing the pacing team for the Madison Half and Full Marathon events on November 9, 2014 – please note if you are also interested in pacing on race day. We give our program pacers first priority. Let Megan know if you are interested.